Enter The Space! 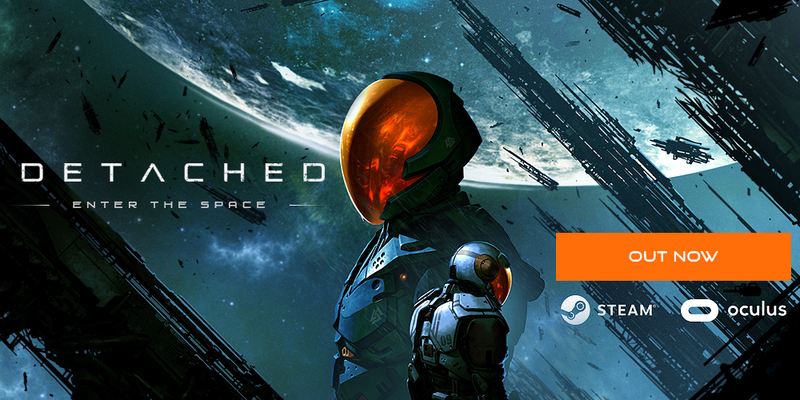 Detached is a suspenseful interstellar duel that demands tactics and skill to survive. Separated from your unit you must race to safety, keeping your vitals healthy and making smart decisions in this visceral exploration of deep space. Detached isn’t just a game; it’s an experience. Unlike many games where VR is a mere expansion, VR is the primary asset of Detached. To complete the game, you must master the controls of your EVA spacesuit in a realistic simulation of the great void. Have you ever wondered how long you could last alone in deep space? In Detached your survival instinct is the key to staying alive. You are dropped at the edge of a universe destroyed by human misrule and extortion. Thanks to years of warfare and greed, the human colonies in deep space are no more. The great factions have crumbled; the corrupt corporations have dissolved. You have to race against borrowed time to find your crew before your oxygen supply runs out. But this is only the beginning… Your innovative Eva Suit needs fuel and you are not able to survive even a few minutes without oxygen. Do you have what it takes to survive in a zero gravity environment? Only players with an iron stomach will be able to withstand these extreme conditions. Experience the vastness of space with astonishing immersion. Designed only for VR devices, Detached recreates outer space, inviting you to prove that you are one of the few who can survive as astronauts. Single-player mode makes full use of the VR headset, giving you the chance to interact with the tranquil expanse of space. Detached’s sandbox environment encourages players to become familiar with the types of experiences normally only felt by astronauts. Get used to the zero-G environment and master the controls before entering challenging PvP arena. Multiplayer mode pits you against your friends in an entirely new take on capture the flag. Race against each other to gather the necessary skills and complete your mission. Every second is precious, and every choice you make can be the difference between life and death. Experience the intense sensations in Detached, nominated for Digital Dragons 2017 Awards in Best Polish VR Game and Best Polish Game Audio. Anshar Studios was founded in 2012 by veterans of City Interactive Games, a company known for titles like Sniper 1 & 2 and Lords of the Fallen. Together as a group of specialists we have worked on 20 commercial titles, released on 9 different platforms and utilizing 5 different technologies. 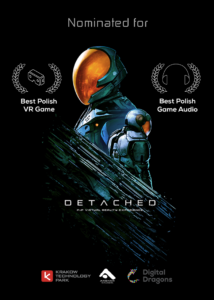 Currently, we’re working on Detached, a space exploration VR Detached game, as well as other promising projects such as VR training program for Polish firefighters. We have also developed the following games: The Path of Kara, Kate Malone: Hidden Object Detective, TinyGameDev and M1 Manager. Find more screenshots from Detached (full resolution) in our press kit. Link can be found at the bottom of the page. Find more videos on Anshar Studios YouTube channel. Except as permitted under copyright law, you may duplicate or transmit any of the content on this site, including files downloaded from this site, without the permission of the copyright holder. Check out Detached media mentions and Press kit. © Anshar Studios S.A. 2017. All Rights Reserved.